New openings, new chefs and plenty of old standbys will keep you sated on the island getaway. The tiny island of Nantucket, Massachusetts, punches far above its weight in culinary terms. Well-to-do summer residents and curious tourists all seek out the island’s best eats — and often, return to their favorite spots year after year, even decade after decade. (If you haven’t eaten a Something Natural sandwich or slurped an ice cream cone from the Juice Bar, have you really been to Nantucket? Debatable.) Mixed in are some worthy newcomers to the Grey Lady—here, the island spots worth a stop this summer. Parts of Nantucket can feel exhaustingly upscale; the remedy is Downyflake, a mid-island, no-frills diner with solid omelets and — crucially — some of the most lovable donuts around. Dainty cake doughnuts, nearly always oven-warm, feel like a throwback to another era, in the best ways. A piping hot sugar donut is one of life’s greatest pleasures. Of course, some are loyal to the puffy glazed and Boston Cream donuts at Nantucket Bake Shop; I see no reason to pick favorites. Still more decadent than doughnuts? The cinnamon-sugar spiral of a morning bun from Wicked Bakery, a pastry so densely buttery, it feels heavy in the hand. 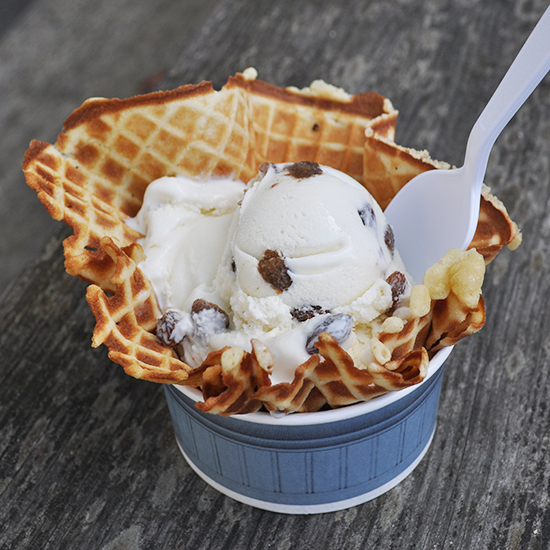 And while Nantucket has a number of solid ice cream spots, The Juice Bar dwarfs them all—in the scale of their servings, with fresh waffle cones that can easily hold three hefty scoops; and in the strength of their following. Forget a line out the door; on a warm summer evening, lines for the Juice Bar can stretch around two blocks. Go for old-fashioned creamery flavors like rum raisin, childhood classics like mint chocolate chip, or the only-in-New-England Grape Nuts ice cream. Beaches mean picnics, and picnics, often, mean sandwiches. Something Natural is the heavyweight, here. The quaint shack of a sandwich shop, on an expansive property dotted with picnic tables, is famous for its home-baked breads; the white Portuguese bread is a Nantucket favorite, though I prefer the oatmeal. On that base, they construct towering, rather sloppy sandwiches (a half will more than satisfy) from great deli meats and crisp veggies; this being Nantucket, you’ll find lobster salad, too. Ordering a chocolate chip cookie is mandatory. I’ve never had a better one. Back in town, Provisions is another island staple; the Thanksgiving-inspired Turkey Terrific and the Curried Chicken Salad, with raisins and cashews, are two standouts. And right next door, the Straight Wharf Fish Store, indeed a working fish shop, sells the best seafood sandwiches in town. There’s no beating their lobster roll, but I’m partial to their fish sandwiches—they take their smaller fillets of swordfish or tuna or cod, toss them in a cast iron pan with butter for a quick sear, and plop ‘em on a bun with tartar sauce. Chips on the side. Take it to their picnic table on the docks, just a few steps away, and thank us later. Plenty of Nantucket restaurants don’t have an entree that costs less than $30, but that’s not to say you can’t have an affordable meal. Corner Table, at the beautiful new Nantucket Culinary Center, is an all-day grab-and-go spot for all kinds of occasions—pastries and breakfast sandwiches early in the day, beautifully composed salads for lunch. Eat out on the streetfront patio—it offers prime downtown people-watching—or pick up lunch or dinner to go. Though just opened last year, it’s quickly become an island staple. Speaking of lunch or dinner to go: Bartlett’s Farm is part gourmet grocery, part farmstand, and a destination in its own right, if only for the experience of driving through their expansive fields to get there. If you’re feeling flush, a quart of their lobster salad over fresh greens is one of the most indulgent barely-have-to-cook-it dinners you’ll find; but every one of their salads, specials and pies is worth a try. This corner of the island is also home to Cisco Brewery. Well known for their Whale’s Tale Pale Ale and Grey Lady beers, among others. Cisco also houses a winery and distillery; the three operations all converge on an open, welcoming patio, where most afternoons you’ll find live music, a few food trucks, and plenty of revelers. Another island institution, the Brotherhood of Thieves is styled after Nantucket’s historic whaling taverns. While there’s a light-filled upstairs and back patio, head downstairs to the “whaling bar,” a low-lit, atmospheric place for burgers and clam chowder and piles of fried seafood with curly fries. A little out of town, Pi Pizzeria crafts wood-fired Neapolitan-style pies both simple (an excellent margherita) and less so (New England clams with garlic, parsley, and Pecorino Romano). 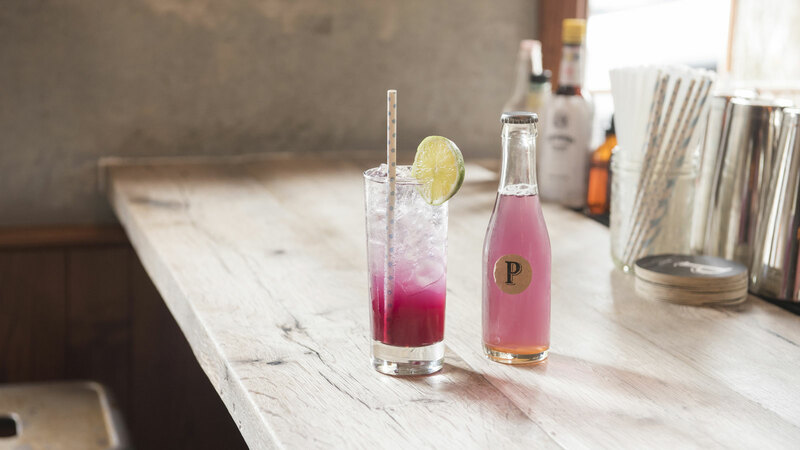 And while Madaket, the far western end of Nantucket, is a trek for most visitors, it’s worth it for Millie’s — a relaxed, beachy place with huge cocktails in mason jars; modern takes on tacos, po’ boys, lavish salad; and a sunset view for the ages. If you’re the kind of diner who likes to be surprised, by clever but never overwrought small plates, The Proprietors Bar & Table is for you. 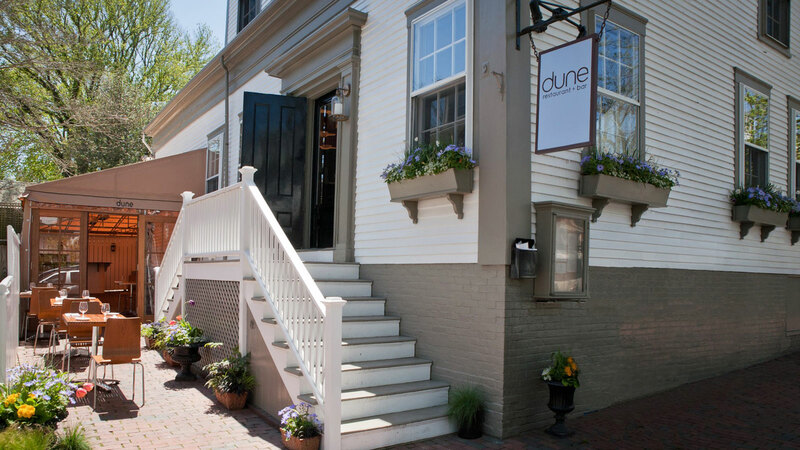 Run by Michael and Orla LaScola (he, the chef; she, front of house and sommelier), it’s one of the most genuinely fun restaurants on Nantucket. 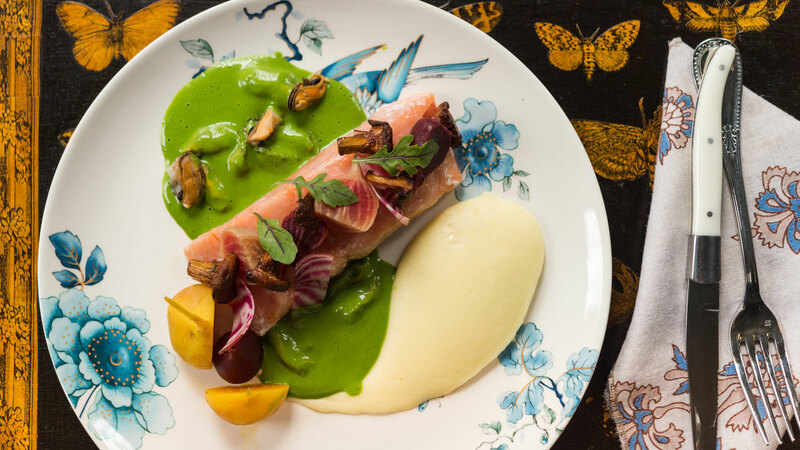 Don’t skip anything involving pork—the Pig Ear Fries are legendary, the charcuterie plate is one of the best I’ve encountered—but move on to internationally-inspired dishes like Smoked Beef Tongue with “everything bagel” spice, hashbrowns, and trout roe or chicken-fried trout, with bacon vinaigrette, lemon confit, and Green Goddess. When it opened late last summer, the Greydon House was something of a curiosity — a gorgeous 20-room hotel dropped in the middle of the historic district simply doesn’t happen on Nantucket. But immediately, the hotel restaurant, helmed by chef Marcus Ware, who earned a Michelin star for his work at NYC’s Aureole, became one of the hotter reservations in town. There’s no wrong step on his menu, from oysters with a yuzu citrus mignonette; to hamachi crudo with mandarin, avocado, shiso, and Meyer lemon; to diver scallops with roasted cauliflower, raisins, pecans, and verjus. Just up the street, Dune is an upscale, sophisticated spot that manages to nail just about everything on its sizable menu, often market-inspired, whether a Bartlett’s Farm summer gazpacho; Maine mussels with broccoli rabe, sweet sausage, and, fennel; or seared yellowfin tuna with charred broccoli-shishito puree, sushi rice, and cashew honey. Around the corner, Ventuno, the site of the former 21 Federal, is well known for its late-night bar scene, but just as much for its modern Italian fare. The Fritto Misto may be the best in town; the spaghetti with ‘nduja and local littlenecks, superb; the 20-day dry-aged, 30-ounce Creekstone tomahawk ribeye, a feast. Internationally inspired Nautilus is a tough reservation, but worth it for the Hawaiian tuna poke, steamed pork buns, and blue crab fried rice. Tasty cocktails help fuel a vibrant bar scene, which starts off lively and picks up further still throughout the night. Same goes for Cru, indisputably one of the island’s favorite seafood spots. Polishing off a few dozen local oysters with a bottle of Champagne, seated overlooking Nantucket’s otherworldly marina, makes for an unforgettable cocktail hour. Just be sure to book far ahead.